This production is very much on the highest level, in terms of vocal performances, sound, and technique. (...) It aims at a general audience without being opportunistic. World première recording - The opera was commissioned by the City of Oulu in northern Finland as part of its 400th anniversary and premiered there on September 16th, 2005. 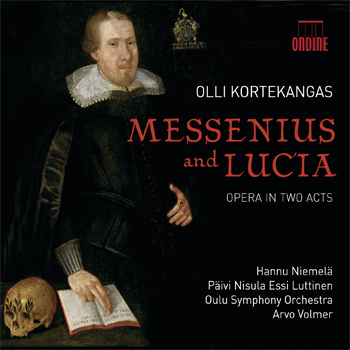 The recording features leading soloists from the Finnish National Opera, as well as the ensembles of the premiere performance. The libretto by Juha Seppälä combines true historical drama with a fictitious mismatched love story. The story, in two acts, traces the life of Swedish historian Johannes Messenius, a popular lecturer at the university of Upsala, who fell foul of powerful people and was sent into exile. Messenius and his wife Lucia spent twenty years as prisoners at Kajaani castle in eastern Finland, where he wrote his most lauded works. He died in Oulu less than a year after his release, in 1636.